Morbid obesity is spreading like a health epidemic. One of the problems with being morbidly obese is all the side effects and health risks that come with it. Very often, these include heart and lung disease and there is a particularly unfortunate vicious circle at work. 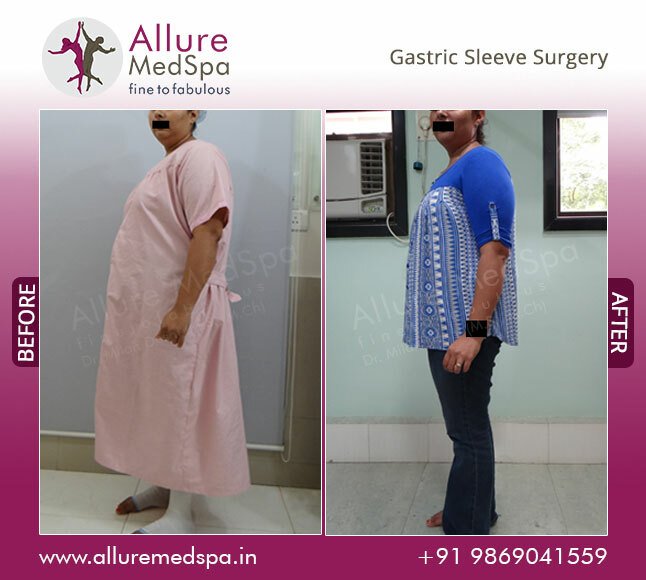 In case, you have any or some of the above conditions and regular exercise and consistent diets have not succeeded in ending your long term struggle with obesity, Gastric Sleeve is the right step forward for you. 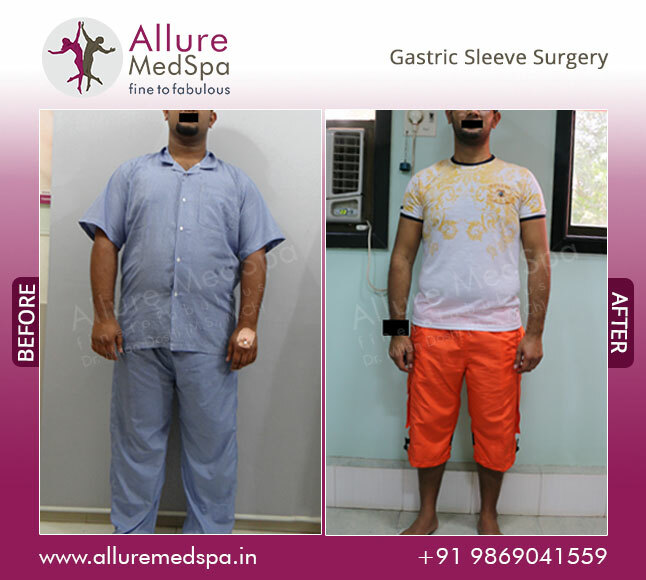 A major advantage of sleeve gastrectomy is that it removes stomach cells that produce the hunger hormone, ghrelin. By drastically reducing ghrelin production, the patient’s appetite and sensation of hunger is dramatically reduced or eliminated. 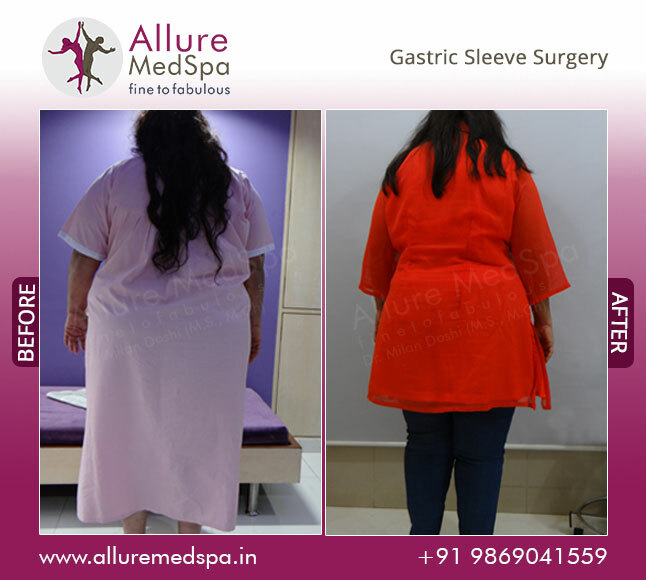 Gastric sleeve surgery brings with it a huge advantage: a short operative time – just one to two hours! 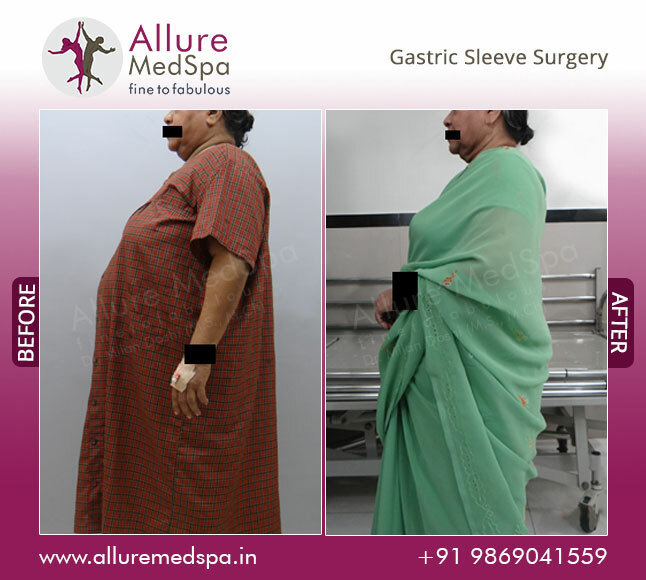 The Sleeve Gastrectomy Surgery (also known as the Gastric Sleeve) involves surgical narrowing of the stomach. It is an innovative new surgical procedure in which, approximately 80 - 90% of the rounded, larger part of the stomach is removed so that the remaining part of the stomach takes the shape of a tube or sleeve. The remaining stomach is permanently reduced to a fraction (10-20%) of its original size. This narrow stomach helps patients eat much smaller portions of food, while allowing for normal digestion and absorption. 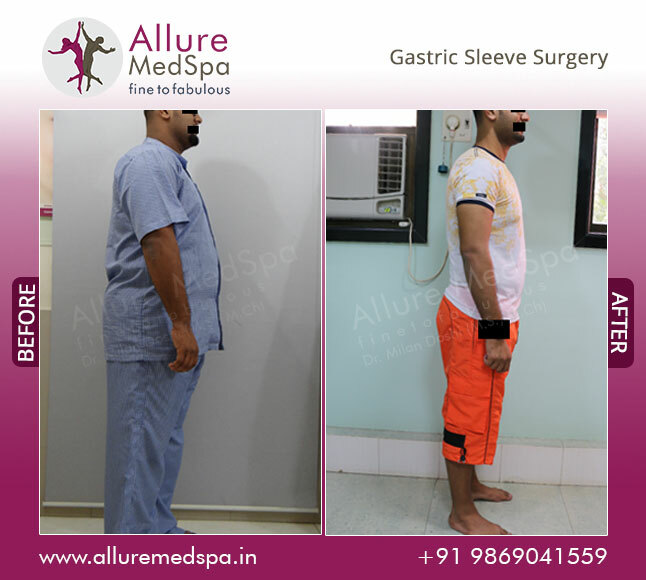 Performed with minimally invasive laparoscopy, the sleeve gastrectomy, is a permanent weight loss solution. 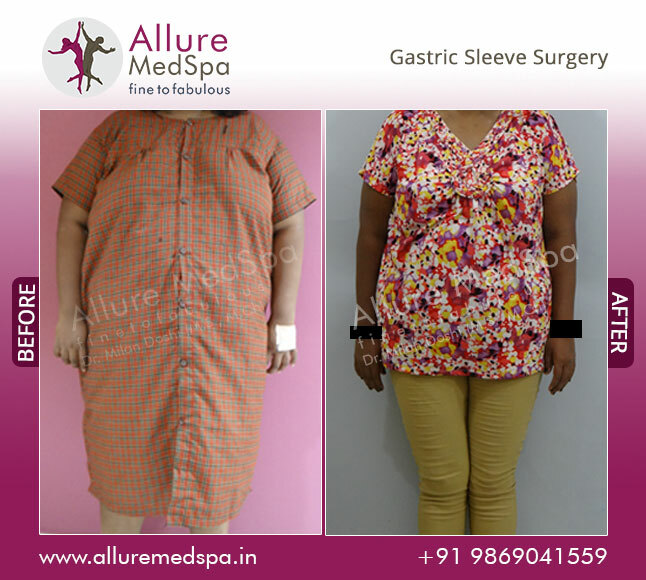 At Allure MedSpa obesity is managed by our multi-disciplinary team including doctors, dieticians, surgeons, nurses and psychologists under the able competence of internationally acclaimed surgeon Dr. Milan Doshi. Using a multi-pronged approach of behavior modification, diet and physical activity, we enhance our patients’ chances of successful and sustainable weight loss. 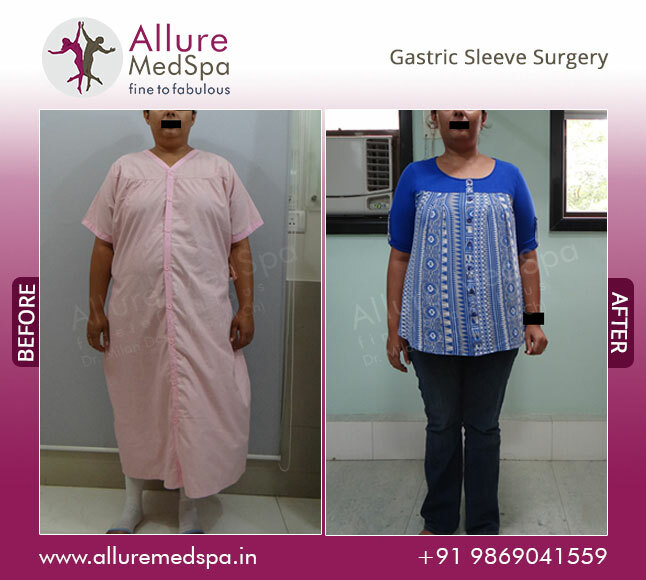 The Gastric Sleeve is one of the safest and least invasive procedures with us. Our results are consistently the best. With the use of latest de-risking techniques, we endeavor to make the erstwhile perceived complex bariatric procedures doable in least time, less scarring, minimal risk of incisional hernia, reduced discomfort (pain-free), and much shorter recovery time.At AMS, we understand how critical anesthesia is to a surgery. Hence we have highly trained anesthetists who administer it with minutest care and ensure you have a discomfort free surgery. 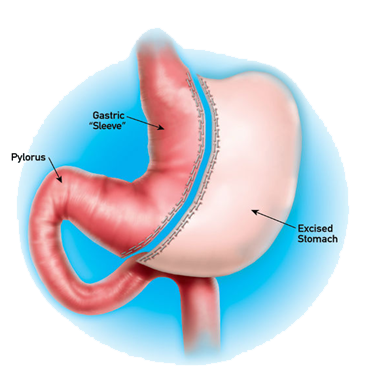 Gastric sleeve surgery takes approximately 1-2 hours to perform. On average, our patients leave the hospital one to two days after gastric sleeve surgery. 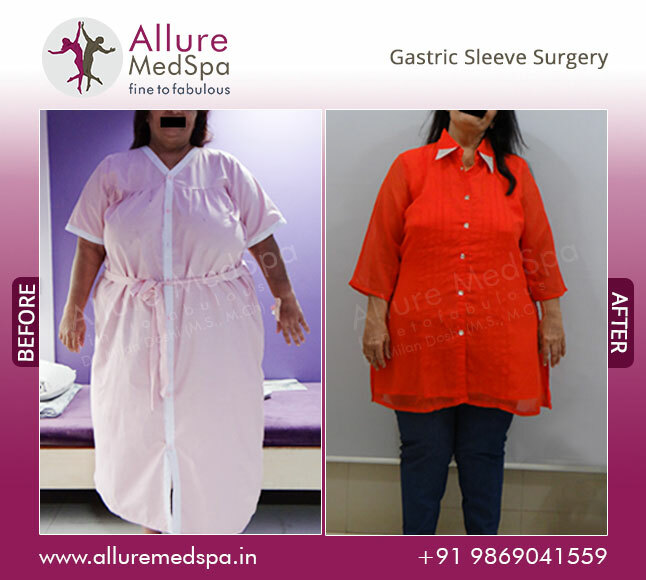 Allure MedSpa which is renowned for its state-of-the-art internationally acclaimed services,offers affordable and cost effective Laparoscopic Sleeve Gastrectomy Surgery. To know more about the cost of your procedure request a consult by filling the form below.Your consultation is your chance to ask questions about Gastric Sleeve surgery and put your mind at rest. I am 5 feet 2 inches tall and I am overweight. I have the condition of thyroid due to which it has become extremely difficult to lose the extra weight from my body. I am suffering from obesity right now. I even tried hitting the gym and even tried controlling my diet, however did not find any solution for the same. I went into depression because of that. One day while visiting for a trip to India, I happened to meet Dr. Milan Doshi in a conference. I talked to him about my problem. He suggested me to come to his clinic. Next day I went to his clinic Allure Medspa. I had a conversation with him. Dr. Doshi patiently listened to all my queries and suggested me to take the Laparoscopic Sleeve Gastrectomy procedure for weight loss. I trusted him completely and followed his advice. He evaluated my body and according to that took some test. After that I was sent to operation theatre for the surgery. The surgery took about an hour. After the surgery was over, Dr. Doshi prescribed me some medicines and food that I need to have. Now, it’s few months after the surgery and I have lost couple of kilos. I feel lighter now. Hopefully, with exercise and diet I will be able to maintain this physique throughout my life. 1) As part of a double-stage process involving two separate operations a year or year and a half apart, it’s often the wisest choice for patients with an extremely high BMI (more than 60). 2) As a stand-alone procedure, it is used for patients who just barely qualify as morbidly obese, with a lower BMI (40-50). 3) Patients who are considered high risk because they have heart and/or lung conditions making any type of surgery risky. 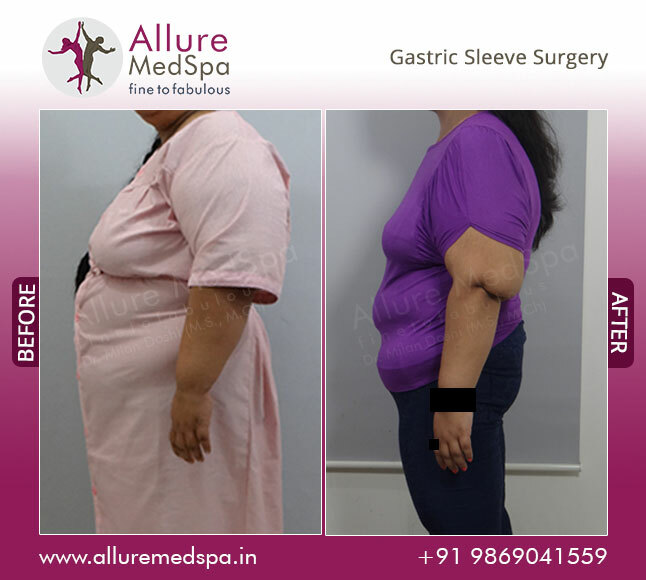 Allure MedSpa is here to help you make informed decisions every step of the weight loss surgery way, starting with the decision about which procedure is the best for you. Your weight-loss journey with Allure MedSpa begins with a series of consultations and tests with our team and surgeon Dr. Milan Doshi. These regular meetings include a detailed discussion of the various surgical options available to you and cover the many questions and any doubts you may have about the surgery. Most patients lose weight quickly and continue to do so for as long as 18 to 24 months after the procedure. Most patients lose 50-60% of their extra weight. As a result of this weight loss, our patients have achieved greatly improved health and lifestyle. Co-morbid conditions get resolved as early as 6-12 months after Sleeve Gastrectomy. Patients experience superb resolution rates for type 2 diabetes, high blood pressure, high cholesterol, and obstructive sleep apnoea. 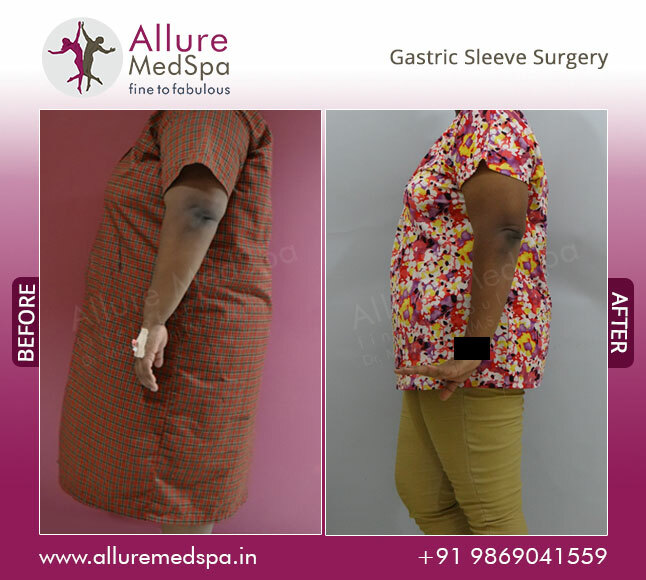 The results from Gastric Sleeve can be sustained for life provided you follow the Allure MedSpa aftercare instructions and adhere to the dietary and lifestyle changes prescribed. Our comprehensive aftercare program offers you the support and encouragement you need for long-term success. What are the risks for gastric sleeve surgery? Bleeding, infection, and blood clots in your legs are possible side effects that may occur shortly after the procedure. Over time, you may also experience difficulty absorbing certain nutrients, or you may develop strictures (narrowing) in your intestine. People who have bariatric surgery are also at risk for abdominal hernias. You will have anesthesia before your surgery to help you sleep and offset pain. 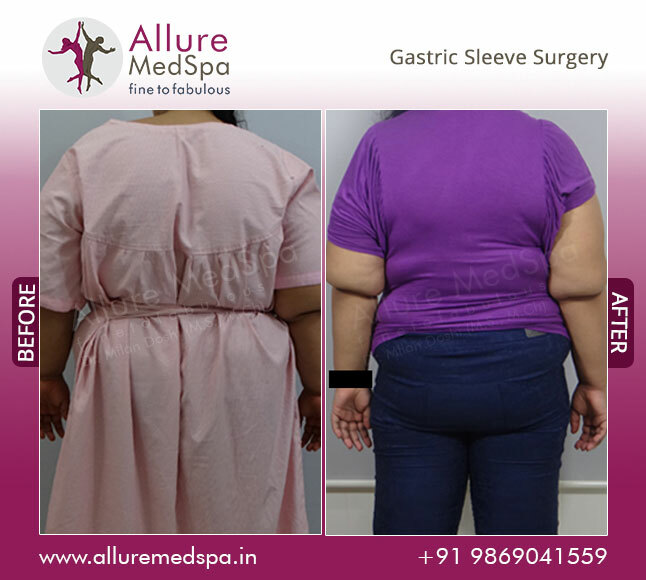 Your surgeon will use laparoscopy for your gastric sleeve surgery. In this procedure, your surgeon makes a few small cuts, or incisions, in your abdomen. Into one of these incisions, he or she inserts a thin, narrow tube (a laparoscope), with a video camera attached. This camera allows your surgeon to view your internal organs. The surgeon inserts additional surgical instruments into the other incisions. The laparoscope guides the use of these instruments. During the operation, your surgeon reduces the size of your stomach. With the remaining tissue, he or she creates a vertical tube, or sleeve, that can only hold a small amount of food. Unlike BPD-DS, this surgery will not affect your intestines. After gastric sleeve surgery, you will probably spend some days in the hospital. Will there be any dietary changes? You may be able to eat only a pureed diet for the first few days. You will need to change your eating habits to compensate for your smaller stomach. Each meal needs to be very small, and you should take care to eat slowly, thoroughly chewing each bite. You may also find it easier to avoid hard-to-chew foods, which can cause vomiting. If you eat too many sugary or fatty foods, the contents of your stomach may rapidly empty into your small intestine, causing unpleasant symptoms like nausea and cramping. This is known as “dumping syndrome.” Work with our medical team to figure out what is best for you to eat. Will I have to take any supplements? People who have weight-loss surgery are susceptible to nutritional deficiencies, because they absorb fewer nutrients. Ask your healthcare provider if nutritional supplements are appropriate for you; many experts recommend a daily multivitamin, plus a calcium-vitamin D supplement. Additional nutrients, such as vitamin B12 or iron, may also be necessary. You’ll need to have regular blood tests every few months in the year after surgery, to make sure you don’t have anemia, high blood glucose, or low calcium levels. Keep in mind that it is possible to regain weight that you lose after surgery. To avoid this, be sure to follow a healthy diet and get plenty of exercise. Is there any foreign implant involved? Yes, it is a safe surgery. Since the gastrointestinal tract anatomy is not altered, food is travelled in a normal way. This results in less chance of developing lack of vitamins and minerals and eliminates dumping syndrome. It also decreases the chance of developing ulcers. 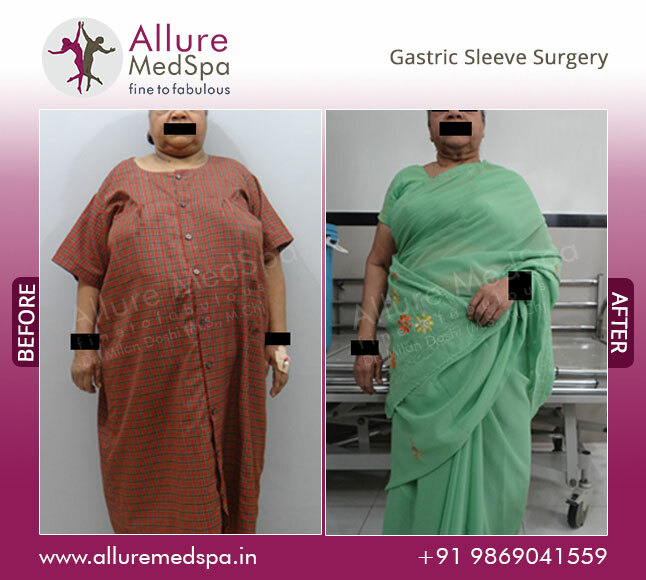 The procedure is undertaken by people who are at high medical risk for bypass procedures, have a high body mass index above 60, or have complex medical history. This will help to lose up to 80 percent of your body weight. How much weight loss can occur after the surgery? A person can lose about 40 to 50 percent of their body weight in 2 years time. However, it also depends on the type of diet you are having and the exercises that you are undertaking. Before the surgery, you will have a discussion with the surgeon and the dietician about the type of food you can have. You will have to adopt a healthy lifestyle. It is best to eliminate sweets and fatty substances to maintain a healthy weight.